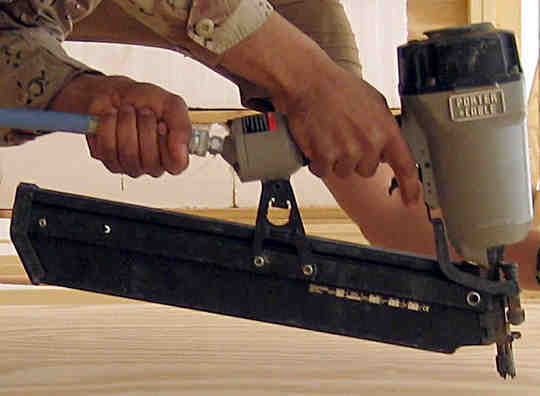 An air powered tool that drives large framing nails. Typically 3 1/2" clipped head nails. 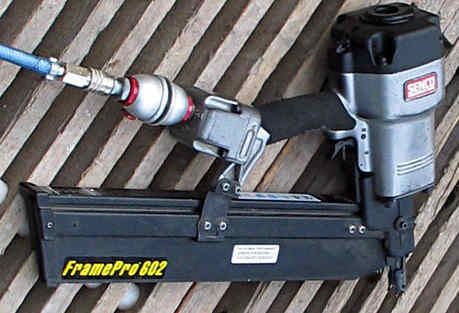 There are many manufacturers that make this type of nail gun, but in my own personal experience, when I first bought a Senco around 1980 they had a reputation of being the best. I have had a few framing nailers in my time, some of them have been stolen, but I honestly don't think that we ever wore one out. They all performed well, and I never had any thoughts about changing brands. Unlike electric tools, air tools are far longer lasting. When they seem to lose their punch it is usually only a case of sending them in for a service, which usually means new seals an small replacement parts that are inexpensive. I always found the Senco guns very easily balanced. Any tool that you have to use for long hours has to be comfortable to use. I guess that any nailer jams from time to time but these ones have a very simple clearing system. The nailer shown here has In-line 30 degree magazine for compact easy manoeuvring like my old ones, but it has a few new features that my old guns did't have. The two previous photos are of nailers that run from compressed air that comes from an air compressor via quick clip fittings and an air line. 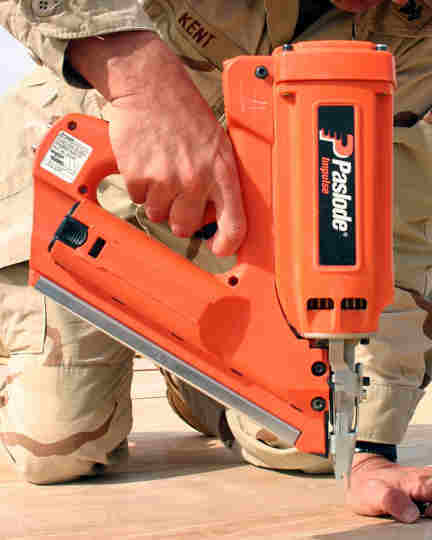 The Paslode is described as a cordless nailer and runs off fuel cell cartridges, so there is no need for the compressor and the air line. I have no idea what the fuel is, I had assumed just compressed air, or what the running costs are, but certainly the fact that it is cordless is a very big point in it's favour. Both for usability and safety. The nails in these machines are called Clipped Head. The reason that the nails are called this is that a small crescent of what would be a full round head nail has been clipped off to allow the nails to sit neatly together in the machine. QUICK TIP: Always look after the packs of nails, don't leave them lying around in the crap. Don't let them get wet. Between jobs pack them to keep them dry as any humidity makes them rusty. Most jamming problems are caused by poor nails, not the machine.